With tandem and offset discs, and deep tillage gear, Buhler is providing two lines of equipment. Buhler Industries announced it's launching two lines of tillage equipment to meet the growing needs of Versatile and Farm King suppliers across the U.S. and Canada. The inventory includes a range of offset discs, tandem discs, cultivators and chisel plows, all built at Buhler's newly-acquired factory in Vegreville, Alberta, Canada. Buhler President Dmitry Lyubimov says, "The Farm King line has expanded and now includes a full range of short-line products. And, we have been very open about our intention to have Versatile offer a product line that caters to the large acre farmers, and these implements are a major part of that strategy." 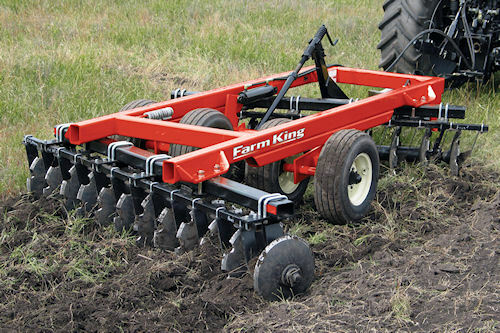 Farm King's new offset disc is part of Buhler Industries new line of tillage equipment being marketed under the Farm King and Versatile brands. The new lines of discs feature the heaviest bearings in the industry. Available exclusively on the Farm King and Versatile discs, the 410WSS bearings carry a three-year limited warranty and the T2-215 bearings carry a seven-year limited warranty. All disc gangs are torqued to 3,200 ft-lbs, and steel fabricated full spools and optional exclusive interlocking half spools ensure gangs stay tight and eliminate broken spools. Both lines of equipment feature full floating hitches which ensures smooth operation in irregular terrain and protects from rock and other obstacle damage underway. For more information, visit www.buhlerindustries.com.